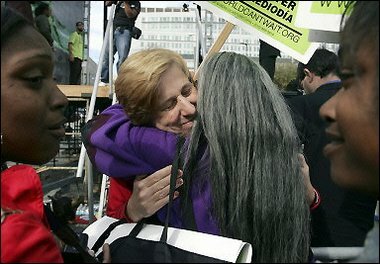 Cindy Sheehan is scheduled to give a talk today at the Marxist Anti-Bush Rally in Argentina. Venezuelan President Hugo Chavez, President George W. Bush’s chief antagonist in Latin America, said the U.S.-sponsored Free Trade Area of the Americas is “dead” as a 34-nation summit opened in Argentina to widespread protests and sharp division among hemispheric leaders. Mexican President Vicente Fox, a Bush ally, countered Chavez by saying a trade accord in the Americas will boost growth and should go ahead even if some countries refuse to join. Only about four or five nations are against it, and their opposition is “ideological,” Fox told reporters. 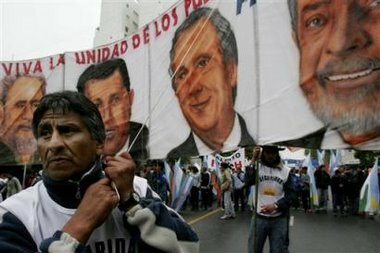 An estimated 10,000 demonstrators, shouting “Get out Bush!” and marching in the streets of this seaside resort, illustrate the skepticism that many South Americans have toward U.S.-led negotiations for a Free Trade Area of the Americas that would from Alaska to Argentina. Bush, who met Friday with national leaders who signed the recently passed Central American Free Trade Accord, says open trade among nations in the Western Hemisphere and beyond would help alleviate poverty. He’s pushing that agenda with the 34 nations gathered at the two-day Summit of the Americas. Bush is highlighting his success by gathering first thing Friday with leaders of Central American nations involved in a recently approved trade pact with the United States. Later in the day, Bush has one-on-one meetings with the president of Chile, which negotiated a bilateral trade agreement with the U.S., and the host of the summit, Argentine President Nestor Kirchner. Bush and an outspoken critic, Venezuelan President Hugo Chavez, were likely to meet Friday, shortly after Chavez’s speech to a demonstration of mostly anti-Bush protesters. Chavez has joked about whether Bush is afraid of him and said he might sneak up and scare Bush at the summit. Anti-war activist Cindy Sheehan hugs a supporter after speaking at a rally organised by the ‘World Can’t Wait! Drive Out the Bush Regime!’ group in San Francisco (AFP) earlier this week. A policeman was hit with a molotov cocktail in an anti-war (?) protest in San Francisco. (via Michelle Malkin) Cindy Sheehan is scheduled to speak to the rally against Bush today with Marxist Hugo Chavez. Today’s protests are expected to peak with a noon address by leftist Venezuelan President Hugo Chávez, who has vigorously criticized Bush and his policies. Sheehan may attend with other families of soldiers killed in the Iraq war, according to media reports. 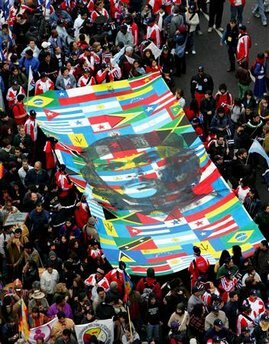 Chávez and organizers of the People’s Summit, and others have called for peaceful marches. But the protests are expected to draw a large number of piqueteros, militant Argentine protesters who almost daily shut down highways and bridges in this country of 39 million to press their demands for jobs and other benefits. 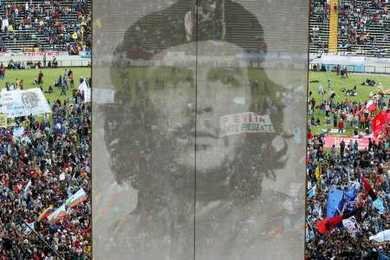 Though, not invited, Castro’s presence could be felt at the Rally! A. M. Mora y Leon has more on the skunk that showed up at the party today at Babalu. Robert Mayer at Publius Pundit has more on the “Fake Anti-Trade Revolution” held today. Michelle Malkin notices “Southern Hemisphere Moonbattery”. In the Bullpen has an update from an American living in Argentina. And, with the protest rally today, the Jesse-Hugo-Cindy Circle is now complete. Update: (3:40 PM CST) Surprise! THE MARXISTS ARE RIOTING!! I have been watching MSNBC for 15 Minutes and not once have they mentioned that the demonstrators are Marxist, communists, anarchists,… nothing! ion that do not like the US economic policies from each of these countries! They will not tell you that 29 of 34 countries are willing to sign a free trade agreement. Bare Knuckle Politics has video of the rioting. (3:50 CST) Still no mention that the protesters are Marxists or anarchists. And, still no mention that the violence at the summit was expected. It is a summit on free trade after all! (4:00 CST) MSNBC is saying that Hugo Chavez has influence on the other countries. Announcer (Bob Kerd?) from the White House says that other countries may not think free trade is such a good idea (4 or 5 out of 34?). He says Bush is not popular there. (4:05 PM CST) FOX News is saying that the violence was obviously planned. They at least call the rioters- “anarchists”. (4:10 PM CST) FOX NEWS David Asman says that some of the violence was anticipated. That Chavez has attracted some of the radical elements seen in the rioting. Asman continues that Chavez is bribing people to join him. Chavez is out convincing people that they are poor because the US is rich. (What a complete different message than MSNBC!) Roger Noreiga now on saying the Bush agenda is about empowering the poor people. The irony is the rioting deviates the attention from extending power to the poor! (4:20 PM CST) FOX noticing the rioters, camera people came with their own gas masks… they were ready to riot! (4:30 PM CST) FOX NEWS says anarchists, communists staging riots. It is the same crowd of antidemocracy protesters, anti-Free Trade protesters who want and get maximum exposure. These people would be the ones to benefit the most from the free trade as evidence proves. (4:40 PM CST) The New York Times in one of its most shameful displays of bias mentions Karl Rove 6 times in the first three paragraphs of their article on the summit but cannot get the gumption up to say that Hugo’s friends are anarchists and communists or that the rioting was expected. The New York Times proves once again that it will do whatever it takes to make George Bush look bad including propping up the Marxist Chavez regime! FOX News says that the rioting is now over.